Community acupuncture is designed as an affordable medical service, providing inexpensive or free acupuncture treatments in a group setting rather than in individual treatment rooms. 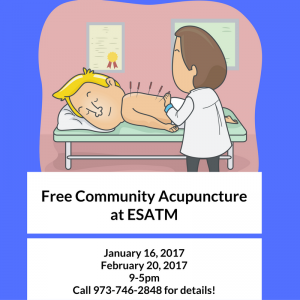 The Eastern School of Acupuncture and Traditional Medicine is now providing free community acupuncture on a regular basis. 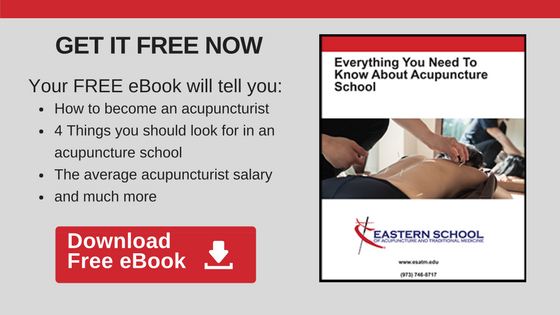 Who is eligible to receive community acupuncture? Community acupuncture is open to all. New patients, returning patients and those who are just curious as to what to expect in an acupuncture treatment are welcome! Medical issues that are treated include (but are not exclusive to) pain management, allergies, migraines, stress relief and smoking cessation. Who is providing the treatment? Year three student interns with be providing the treatments under the direct supervision of ESATM licensed faculty and clinic supervisors. Please call 973-746-2848 for more information.